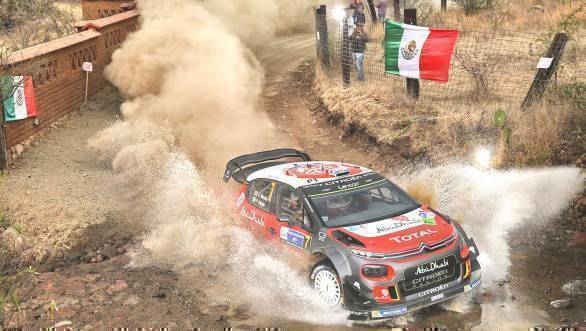 Kris Meeke's fourth WRC career win suddenly put Citroen back into championship contention for 2017 on Rally Mexico. This was dramatic for various reasons firstly because of a chaotic situation when the Friday route was shortened because of logistical problems after the Ceremonial Start, then a remarkable series of technical misfortunes for nearly every top crew on the first stage on the Friday and lastly an incredible accident for Meeke within sight of the flying finish of the last stage. 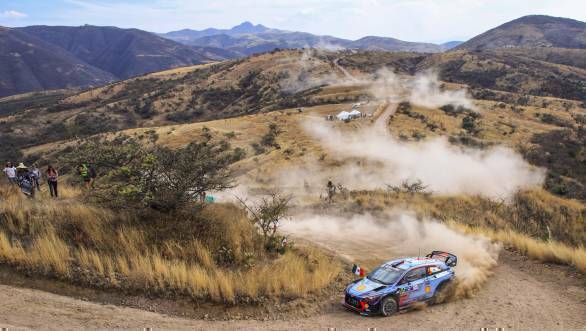 Sebastien Ogier hung on to second place, leaving Mexico with M-Sport leading both the Manufacturers' and now also the Driver's series. Citroen's victory represented the fourth successive WRC win for a different manufacturer. There was a very small entry. Only 24 cars arrived, the number already bolstered by entries from the FIA's regional NACAM championship, without whom there would have been only 18. Low level entries are nowadays endemic on long haul rallying and a characteristic which has recently extended into the FIA's regional championships in Africa and the Middle East. Zero points for quantity but almost maximum for quality, however. Half of the whole field were World Rally Cars, eleven of which were 2017 version cars, and each team proved to be competitive on this rally. At the end of Friday each team had a car in the top four places. The event started with the news that Elfyn Evans's DMack sponsored 2017 Fiesta WRC had a five minute penalty for requiring an engine change after scrutineering. It meant that from the second full day onwards he was running first or second car on the road and was only able to recover to ninth place overall. DMack supplied new run-flat gravel tyres and Evans' won three stages, a total beaten only by Neuville and Meeke. The second event drama came on the Friday. Close to the start of the event the organisers had negotiated a deal with the Mexico City authorities to hold a Ceremonial Start coupled with a couple of runs round a downtown stage, right in the centre of the City. Cars were transported down from Leon and apart from inclement weather the activities in the City went well. There was however a serious road accident which blocked the highway for the return trip and the transporters were badly delayed, arriving too late for the cars to be offloaded before leaving for the first loop of stages. Like in Argentina 2007 it meant rescheduling the route and this time two major stages were lost. 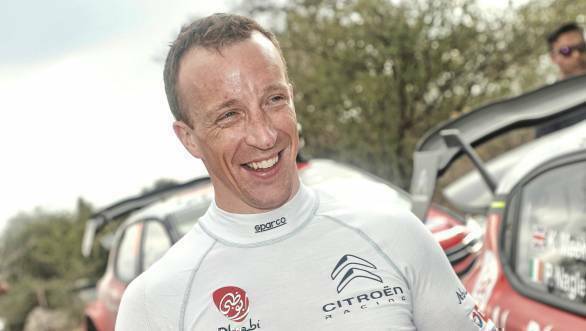 Not for the first time, Kris Meeke took advantage of a golden opportunity. Like his victory in Portugal in 2016 after running 13th on the road on Days1+2 and then his win in Finland after running eighth on Days 1+2, his lack lustre performances in the WRC earlier this year meant he again started with a highly advantageous starting position. He used this benefit to full effect, coupled with another golden opportunity. He had a trouble free run on the first representative stage on the event when all the other top drivers had technical trouble, launching himself into a lead he held for the rest of the event. 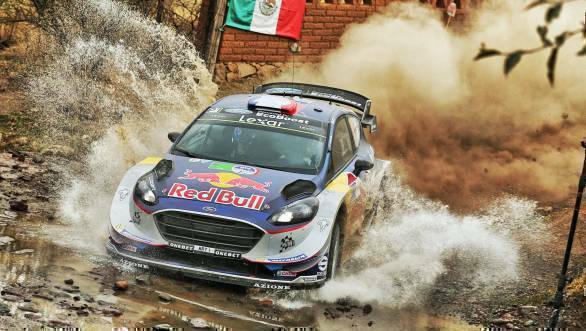 This was the first time the 2017 World Rally Cars faced technically challenging conditions which combined heat and high altitude with long twisting, slow stages, leading to overheating in rival cars. Once the shock of these troubles died down, the rest of the event was very much predictable. There were tyre choice dilemmas created by the preferences of drivers to drive on the faster but less robust soft compound tyres, while the tyre suppliers (which in effect means Michelin) dictated that hard compound tyres would overall be more suitable on this event and drivers struggling with worn out tyres. And of course there was another last minute panic for Meeke. This time he went off the road at the end of the final stage, regaining the stage after a detour through a track-side car park, happily retaining his lead. "I got caught out on a bump after the famous jump at a fast right. I'm a lucky boy, a lucky lucky boy. OK its certainly one way to finish a rally, but OK we didn't need that ... Trying to find my way out of the parked cars and trying to find a gap in the hedge, a lot of things went my way". The opening orthodox stage told almost the whole story of the rally, with Meeke controlling his dominant position. There was a shock at a superspecial at the end of Friday's route, when all three Hyundai i20 Coupe cars, which had been lying 3rd, 4th and 5th behind the leaders Meeke and Ogier, suffered fuel filter problems at the same time and place, with Dani Sordo suffering time-wise most of all. Top Hyundai driver nearly all the way was Thierry Neuville in third place behind Meeke and Ogier, but Hayden Paddon could not make competitive times. Ogier only lost his chance of pressuring Meeke midday Saturday when he spun. As the rally progressed, however, the team in trouble was Toyota, as Jari-Matti Latvala struggled to recover from his running order handicap as championship leader to run first car, suffering badly. His teammate Juho Hanninen, who had been leading after the Thursday superspecial stages in Mexico City, (his times achieved before heavy rain fell) struggling, feeling unwell. Other excitements were when Stephane Lefebvre slid irretrievably into a ditch in the second Citroen and a roll by the private 2017 Ford driver Lorenzo Bertelli. There were no WRC3 entries, only one entry (the Mini of Valeriy Gorban) in WRC Trophy and five in WRC2. A most exciting battle of the whole event was between the Skoda of Pontus Tidemand and the Ford of Eric Camili, with Tidemand entering the final morning with only a two second lead. Third was the Mexican Benito Guerra, the former FIA Production Car World Rally Champion on his first event in an R5, which was plagued (like with many others) with brake troubles. In the Manufacturers series M-Sport extended their lead over Toyota to 36 points, in the Drivers series Ogier was ahead of Latvala by eight points, with Ott Tanak third. In WRC2 Tidemand, following successive victories in the category, took the lead in the series with Camilli in second ahead of former leader Andreas Mikkelsen.